Our Toddler Olympics always calls for a Pom Pom Push! Last year during our Toddler Winter games this Pom Pom Push activity was a huge hit! Have you ever hosted a Winter Games? If you like easy activities that can be prepped in just a few seconds, this one is for you! You can host one anytime and they are so easy to set up! Go here to check out more details of how we set up our winter games. We hosted a family winter games AND toddler winter games! Both were so fun! 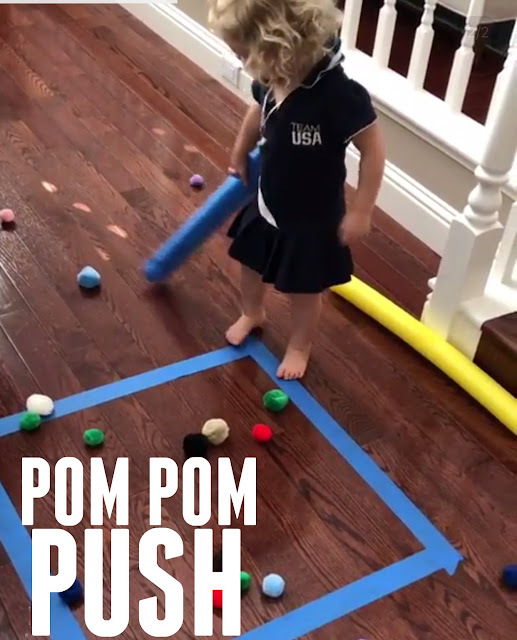 Here's how to set up your own Pom Pom Push! PS- This was our toddler interpretation of curling. The pom poms were the "stones" and kids had to push them along the floor. To get started you need to get your materials together! You only need pool noodles, pom poms, and painters tape. Next, tape a big square onto the floor using painter's tape. You can create one square for all of the kids to use or make a square for each child. After that, drop a bunch of pom poms on the floor and encourage the kids to push them and whack them until they land inside the big blue square. This is such a fun game to help kids work together and practice some hand-eye coordination. Kids also naturally talk about the sizes of the pom poms and the colors! As they hit and move the pom poms you can describe which ones they are hitting. Counting can also be embedded into this activity as kids count to see how many pom poms are inside the box and how many are outside. Not only is this a quick activity to set up, but it is also a wonderful one to help get kids moving... especially when they are stuck inside during the winter! Do you have any other favorite easy to set up winter activities? Do you have any other activities that would go great with our Winter Games theme?